The Cleveland, Ohio, reunion was a blast! Ten of us alumni met and relived our TASIS experiences, and the little VW buses sent from Lugano were a big hit, creating a lot of nostalgia. Since our initial reunion in 2001 in New York City, the classes of 1970, 1971, and 1972 have held joint reunions periodically. This year the attendees were Charles Hodgkins ’71 with wife Kathryn Munn, Jeff Myers ’70 with fiancee Kathy Zepp, Tracey Stephens ’71 with husband Jack Cauffari, Debbie Billingsley Lichtenberg ’71, Robin Thomas ’71, Penny Payakaniti Johnston ’72, Jana Swanson Miller ’72, Peter Belkin ’72, Nathan Anderson ’72 with wife Patty Hayden, and myself with wife Susan Clouston. 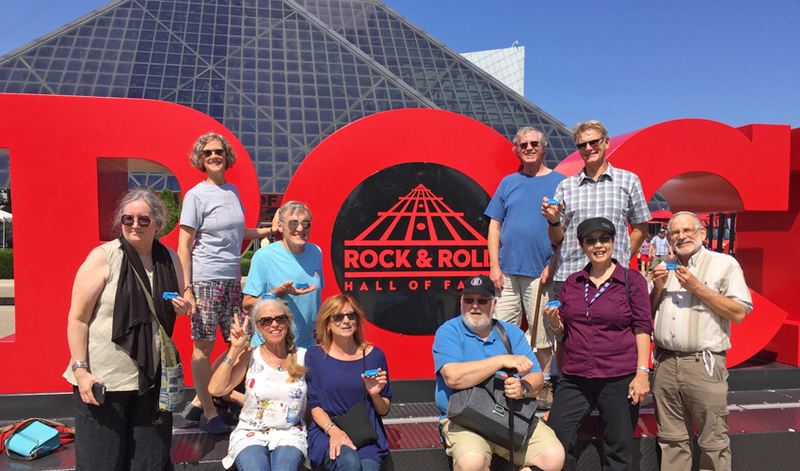 On Saturday, August 4, we toured the Rock and Roll Hall of Fame and Museum, and then in the evening we had a dinner cruise on Lake Erie, which reminded us of Lake Lugano cruises. It took a while to recover from all the partying! Charles has volunteered to organize the next reunion in California in 2020. As soon as the date is announced, I will highlight it on my calendar and keep the dates open!